Vodafone UK has unveiled its Power Shorts and Recharge Sleeping Bag ahead of the Isle of Wight Festival - two innovations that have the capability to harvest body heat and movement to boost the battery life of mobile devices at summer events. The technology is being developed in partnership with the Electronics and Computer Science experts at the University of Southampton, with the aim of providing a 24-hour source of power for people camping at outdoor music events. Kinetic energy is mechanically gathered when ferroelectret materials incorporated into the product are squashed or deformed. These foam-like materials contain voids - the surfaces of which are permanently charged. As the size and shape of the voids changes, a net charge is produced at the surface of the material. Thermal energy harvesting comes from the ‘Seebeck effect’, a process that produces a voltage from the temperature differences across a thermoelectric module. In this case, the modules are printed on the fabric of the sleeping bag. Current trials show that after a full day’s walking and dancing, the harvesting material in the Power Shorts will have been through enough activity to charge a smartphone for over four hours. In addition, heat generated during an eight-hour snooze in the Recharge Sleeping Bag could add 11 hours onto a smartphone’s battery life. Stephen Beeby, Professor of Electronic Systems at the University of Southampton, has consulted with Vodafone to assess the state-of-the-art development. 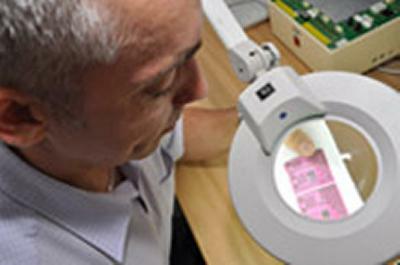 Professor Beeby, who holds of an EPSRC Leadership Fellowship in the field of energy harvesting, is leading a team of researchers to provide a toolbox of materials and processes suitable for a range of different fabrics that will enable users to develop the energy harvesting fabric best suited to their requirements. Applications for the research include using the energy to power wireless health monitoring systems, as well as consumer products such as MP3 players. Applications also exist in the automotive sector.